Winning projects used technology such as artificial intelligence, IoT, virtual reality/augmented reality, cloud, data analytics and mobile/smart devices to drive business innovation. To be successful today, organizations must use technology to do more than improve operational efficiency. In this digital era, organizations need to be visionary with their IT initiatives. Executives need to look for processes where technology not only automates, but also transforms. They need to find areas where technology can produce quicker results and create new opportunities that surpass what mere humans can do. To do that, leading organizations — in both the for-profit commercial and nonprofit sectors — are turning to cutting-edge technologies such as artificial intelligence, augmented reality, virtual reality and the internet of things. They’re also deploying mobile systems and analytics tools in new ways to deliver insights to workers when they need the information, wherever they might be. The results of these innovative undertakings are impressive. Executives across a range of industries report gains in productivity along with dramatic reductions in errors, losses and costs. They also cite significant new business opportunities that wouldn’t be possible without their forward-thinking digital blueprints. IT research firm Gartner says enterprises today are part of a maturing digital ecosystem, where companies, their customers, regulators and other stakeholders interact electronically. To keep pace, enterprises are spending more on digitalization. The 2017 Gartner CIO Agenda Survey, which gathered responses from 2,598 CIOs in 93 countries across all major industries, found that typical CIOs spend 18% of their budgets supporting digitalization. That figure is expected to grow to 28% in 2018. Moreover, Gartner reports that top-performing enterprises that have fully integrated digitalization into their business models are spending 34% of their IT budgets on digital initiatives and will increase that to 44% by 2018. 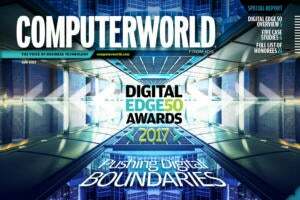 At its AGENDA17 conference in March 2017, IDG Enterprise recognized 50 organizations that excel in digital transformation with Digital Edge 50 awards. A panel of executive peers selected these 50 enterprises based on the complexity, scale and outcomes of the transformative projects implemented by IT leaders and their business-side partners. These 50 organizations, which represent a wide range of industries, from agriculture to healthcare to real estate, and hail from all around the globe, demonstrate how innovation and ingenuity in IT can produce significant, measurable business results. Read on for a brief description of all 50 projects, plus a more in-depth look at how five of Digital Edge 50 honorees are using digital technologies to transform how and what they do. Case Western Reserve University & Cleveland Clinic: HoloAnatomy: Microsoft’s HoloLens augmented-reality technology helps students learn anatomy without dissecting cadavers. Dalian Wanda Group: Wanda Plaza Huiyun Intelligent Management System:A hybrid cloud-based platform helps manage equipment at hundreds of sites. E&J Gallo Winery: Mobile Vineyard Management: Custom-built mobile apps consolidate insights across multiple systems. Kaiser Permanente: AutoCal 2.5:A web services tool automatically calculates patient insulin dosages. National Collegiate Athletic Association: Fly Me to the Cloud:The cloud enabled employees to use Office 365 tools to securely access email.